Please note that this JJOSXL tutorial is not a definitive list of all JJOSXL shortcuts, as new ones are discovered all the time (or forgotten!). 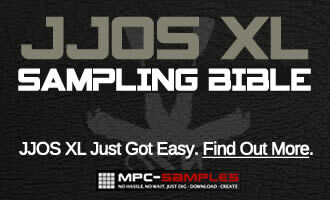 This list mainly consists of all the shortcuts used in my JJOSXL tutorial book ‘The JJOSXL Sampling Bible‘, but I also added a few others for good measure. I’ve bound to have missed many other shortcuts, so if you know of any other JJOSXL shortcuts, let me know in the comments and I’ll get this JJOSXL tutorial updated. Please note that these JJOSXL shortcuts are equally suitable for JJOS2XL (MPC1000) and JJOS-XL (MPC2500), but I do assume you have the latest version of the OS (3.25 at the time of writing). Jump to Top – to jump to top row in any screen, hold down SHIFT and ‘up cursor’. Faster data wheeling – Hold down SHIFT or TAP TEMPO (NOTE REPEAT) while data wheeling to increase the unit value for each ‘click’ tenfold. Screen shortcut 1 – If you find yourself regularly going to a particular screen (e.g. TRIM), you can assign that screen to the MAIN key, so hitting the MAIN key twice will send you direct to that screen. For example to set TRIM as the favourite, hold down the MAIN key and hit pad 6. Now the MAIN key will alternate between MAIN and TRIM. Also shows that ‘MAIN & pad’ can be used instead of MODE & pad. Screen Shortcut 2 – MODE & pad 10, F5 – set to MODE CHANGE. This gives you a second shortcut key that allows you to alternate between two of your favourite screens. To set, hold down the NUMERIC key, press the pad relating to the screen you want to ‘favourite’. Release NUMERIC and hold down again and hit the pad relating to the second favourite screen. Now you can alternate between the two by pressing NUMERIC. Change Full Level Setting – To change the velocity that FULL LEVEL will produce when you hit a pad, hold down FULL LEVEL and use the data wheel to select a new velocity. So set it to 60, and each time you hit a pad when FULL LEVEL is turned on, a note with a velocity of 60 will register, instead of 127. Take screenshots – MODE and pad 9, F6, set to ON. Now if you press UNDO, JJOS will create an image of the current screen and save it automatically to the root of the current disk. UNDO will therefore no longer ‘undo’ anything until you switch screenshots off. Sample scrolling – In the PROGRAM > SAMPLE screen, with the SAMPLE column highlighted, the Q1 slider will scroll through the samples just like the data wheel does. Copy pad parameters – using the cursor, highlight any parameter on any pad, hold down UNDO SEQ and hit a different pad – the parameter is copied. If you keep UNDO held down, you can also change banks. Universal track selection – In most screens where track numbers involved, hold down MODE and scroll the data wheel to select new track – there’s no need to have the track parameter highlighted. Quick Track Selection – Hold down AFTER (for Q2) and hit a pad to select the track with the same number as that pad (e.g. pad 6 will select track 6). Universal sequence selection – Hold next sequence and scroll data wheel to scroll through sequences without having to highlight the top row sequence name. Quick TC set – Hold down NOTE REPEAT to set TC value using the F keys. To turn TC ‘OFF’, repeat by ‘deselecting’ the currently selected TC. Turn TC: OFF – NOTE REPEAT, press the highlighted TC. Move in single ‘ticks’ in GRID EDIT – Hold down shift and scroll the data wheel to move current time in single ticks rather than in TC value. Change MAIN view – hold down SHIFT and F3 (VIEW) to change the entire MAIN page view, depending on your preference. Q sliders for trimming – hold down Q1 AFTER and move the slider to change the start point. Do the same with Q2 for the end point. Sample Edit shortcuts – Hold down SHIFT to directly access sample edit screens such as ‘Normalize’ and ‘Extract’ (hence no need to hit EDIT and scroll). Different edit options available in TRIM and CHOP. Note On Preview – Pads 1 to 4 give a ‘note on’ preview, where you control the duration of the preview by holding down the pad. One Shot Preview – Pads 5 to 8 give a one shot preview, so the region will play back from start to end without having to continue holding down the pad. This is a great list! Thanks for posting. The only thing I can think of is that you can also get faster Data Wheeling when you hold down the Tap Tempo/Note Repeat button, which I prefer because of its position next to the wheel (on the 1000). Thanks, never spotted that one – I’ll add that in a sec. It seems to be same ‘x10’ increase. Very useful list. I knew some of them, but others were new to me. Kindly appreciated! Don’t know if its a ‘shortcut’, but just to be sure that it’s publicly known: Since JJ brought an update for JJOS XL in November or so, one can assign mute groups in ‘mute track’, so e.g. if TR 1-3 has mute group 1, as soon as you push any of PADS 1-3, all three are muted. Thanks Jacob, maybe more of a feature than a shortcut, it’s a fine line! Hello! very usefull thank you! I got a problem with the jjosxl that i cant find a solution for. When i press the mute track button and i change from one track to another, the track i muted continues to play instead of stopping. So i get a mash up of the two..
hi i need to know if there is a way to load up my sets with out usein the f6 to load it up its not workin for me anymore an same with f5 help! !